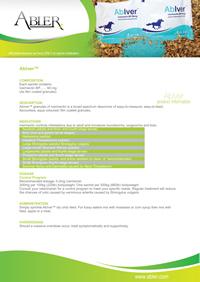 AbIver™ combats internal parasites that are costly and damaging to the health and performance of your horse. Now with AbIver™, horse owners have a single easy-to-use horse wormer that is effective with a single dose. 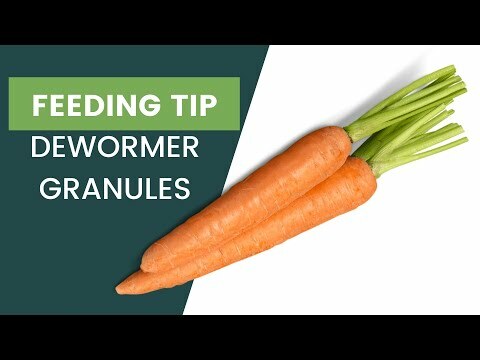 Worm infestations can range from sub clinical to critical, severely affecting your horse's health. They rob precious blood, nutrients, and energy from horse host. In their various larvael stages some species burrow into tissues and vital organs such as the heart and liver. Just sprinkle AbIver™ dry onto feed. For fussy eaters, mix with molasses or corn syrup, and then mix with food, apple, treats, or a mash. IMPORTANT: Do not smoke or eat while administering the medication. Avoid contact with eyes, and wash hands after use.